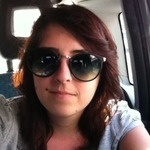 Hi :) I'm Raffa and I'm an Italian girl who wants to travel around the world. I studied English and Spanish at university and I'd like to improve these beautiful languages. I lived in Madrid for 10 months, in London for 6 months and in Rome for 4 years. My dream job is working as a receptionist in one of these cities. I love animals, I have a little dog called Chuck, I love him soooo much. My best friend is my sister, I can't live without her!! !